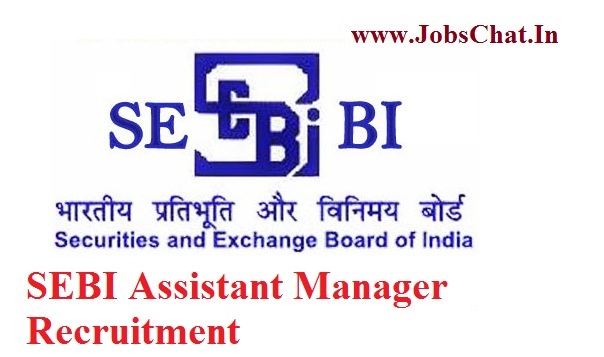 SEBI Assistant Manager Recruitment Notification 2018 is put forward by the Securities and Exchange Board Of India to empower 120 Vacancies Of Assistant Manager i.e Officer Grade A in multiple streams across India. And Online SEBI Officer Grade A Application Form is provided at www.sebi.gov.in and intimate all the candidates to submit the form on or before 30th September 2018. SEBI Assistant Manager Notification 2018: SEBI which is called as Securities and Exchange Board of India. In this article, we are supposed to release a notification named SEBI Officer Grade A Notification 2018 for all the job seekers who have completed their graduation and waiting for the opportunity to apply for this job. The candidates can apply the SEBI Assistant Manager Notification through online mode only at the official website www.sebi.gov.in. As the SEBI offers a total of 120 Posts, most of the postulants are started to enrol as it falls Under Central Government Jobs. The candidates who are applying for this job before checking the details like eligibility criteria, educational qualification etc. The selection process, application fee, exam pattern etc are check at below link. SEBI Assistant Manager Recruitment Notification 2018 has been released. All the interested and applied candidates can apply it the application forms available from 15th to 30th September 2018. So it is requested that every interested candidate applies the application form and download the hardcopy of it. Getting a job in this SEBI is the best opportunity for all the postgraduate and graduates. The applied candidates can undergo the selection process of the initial stage which is conducted by the team of SEBI. As www.jobschat.in offers the in-depth info about the www.sebi.gov.in Assistant Manager Notification, bookmark our page and know all the updated information offered. Applicants who are appearing in SEBI Group A Officer Assistant Manager Recruitment 2018 should have the following qualifications from a reputed organisation and Post-Wise Vacancies are also mentioned. According to the SEBI Norms, the Candidates must have the Age Limits as mentioned here. Candidates must pay the Application Fee As specified below for the SEBI Recruitment For Officer Grade A Jobs having 120 Vacancies. Candidates will select by their performance in following selection rounds conducted by Securities and Exchange Board of India. Candidates who got finalised for the SEBI Jobs will get the Pay scale Rs.28,150/- to Rs.55,600/- from SEBI Recruitment department. Log onto the official website of SEBI, i.e. www.sebi.gov.in. Click on the SEBI Careers section in the home page. On that List Open SEBI Officer Grade A Recruitment Notification 2018. Read all the information carefully to get eligibility details. If candidate suitable, open SEBI Assistant Manager Application form. The candidate has to fill all the details with correct information. After that Upload passport size photo along with the signature on it and other documents. Recheck the entire form after filling all the details. Send the SEBI Assistant Manager application form before the last date by clicking on submit button and keep a copy of the application form for future reference. SEBI 120 Officer Grade A Job Openings is informed only for the Graduates. As we have provided the Job Vacancy Info, it also affects the selection of a candidate in the selection rounds. And the SEBI Have the chance to Raise or withdraw the Available 120 SEBI Assistant Manager Jobs at any time. So the candidates must view the prescribed SEBI Assistant Manager Recruitment Notification 2018 which was given on the official website regularly. And the applied candidates start their preparation by seeing the Syllabus. Keep in touch with us for any modifications of this post refer this website.